Hydrogen peroxide has earned a reputation for being an effective household bleaching agent and disinfectant. 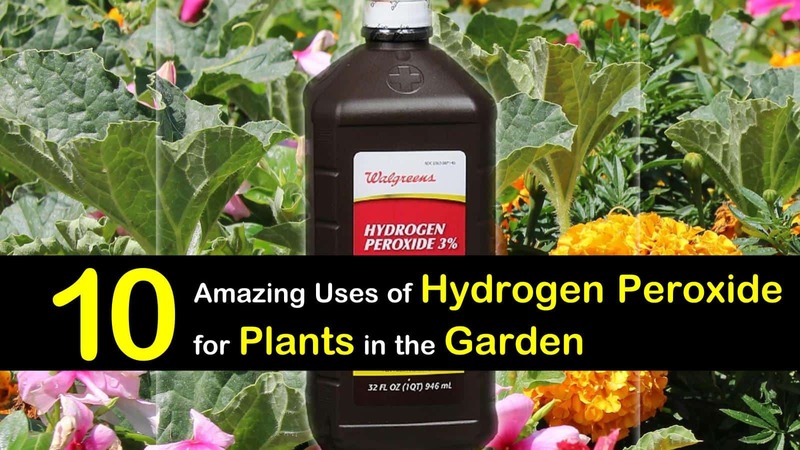 What you may not know is that you can use hydrogen peroxide for plants and other gardening tasks. 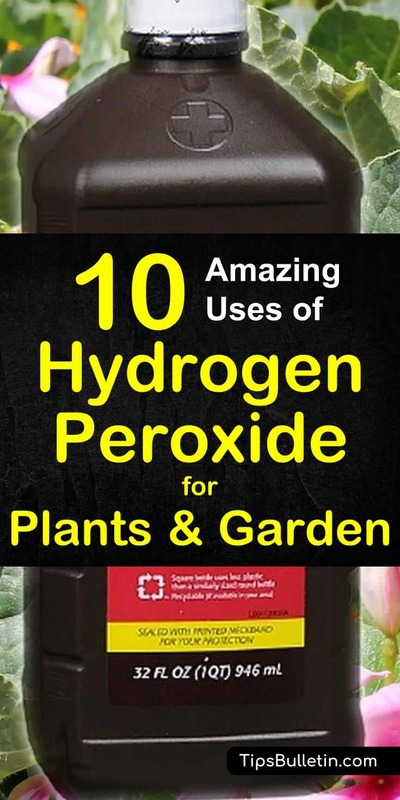 Using hydrogen peroxide for the garden will save you money and time. When diluted, it has numerous uses in both the home and the garden. This is because of its ability to generate antimicrobial and oxygen properties. A colorless liquid, hydrogen peroxide has a chemical formula of H2O2, which is similar to water. The only difference is the extra oxygen atom that it contains that breaks down, releasing the molecule of water. It is this extra oxygen atom that makes hydrogen peroxide such a useful ingredient. It acts as a supplement of oxygen for your plants and aerates the soil when the oxygen is released. Although hydrogen peroxide is commercially available, it can’t be considered organic because plants and animals produce the chemical naturally in their tissues and cells. But, because it ultimately decomposes into oxygen and water, it is extremely environmentally friendly and safe to use, even in organic gardening. When you overwater your plants, you cause a shortage of oxygen at the roots. Overwatering fills the spaces of air found in the soil around your plants, efficiently suffocating the roots of the plant. This lack of air causes the plants especially ground cover plants, to begin dying after just 24 hours. To save your plants from this issue, you can water them with a mixture of one quart of water and 3 percent hydrogen peroxide. The extra oxygen found in the hydrogen peroxide delivers the much-needed oxygen to the plant’s roots. After applying this solution to your plants avoid watering again until the top two inches of the soil is thoroughly dried. Does hydrogen peroxide kill fungus? Yes, similar to neem oil for plants, you can use hydrogen peroxide to combat every kind of fungal infection that is affecting your plants. Fungus on your plants can render them weak, effectively keeping them from growing. Use the following solution on any plants that show signs of powdery mildew, rust, white spots, and other fungal infections. Combine the ingredients in a spray bottle. Spray the solution on any plant that shows signs of fungal infection. Be sure to use the correct dilution of hydrogen peroxide as too much can burn the tissue of the plants. It is crucial to always experiment in a small area. Young seedlings can quickly be killed off by seed-borne pathogens before they even have a chance to take hold. You can avoid this by disinfecting your seeds before you sow them. Using 3-percent hydrogen peroxide concentration, heated to 1400 F, soak your seeds for five minutes. If you are growing sprouts, whether for personal or commercial use, it is essential to thoroughly disinfect the sprouting trays with hydrogen peroxide to avoid contamination by foodborne illnesses like e-coli, salmonella, listeria, and others. Let the seeds soak in 3-percent hydrogen peroxide for five minutes. Then thoroughly wash off the chemical by running water over the seeds for a minute. Hydrogen peroxide will help your seeds germinate faster and will promote healthy growth. This is because when the hydrogen peroxide breaks down, it releases oxygen. Since a high level of oxygen is a necessary ingredient for sprouting seeds, the extra oxygen supply is exceptionally beneficial to new growth. 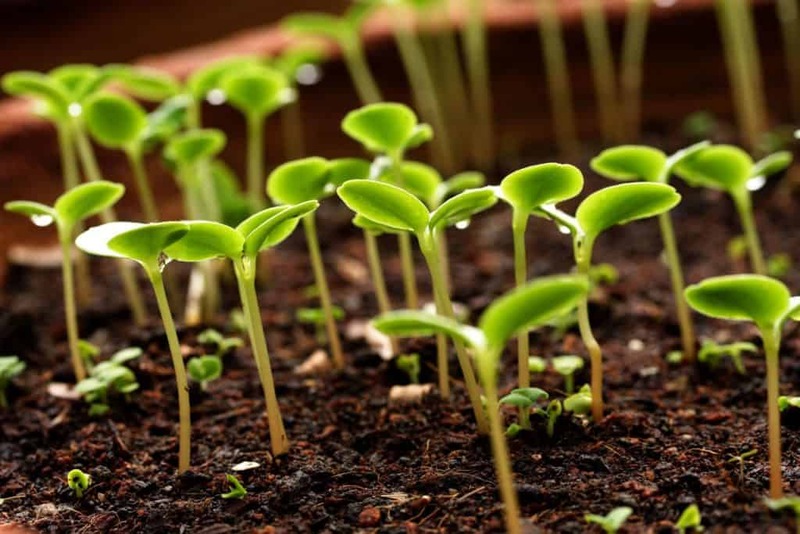 To accelerate germination, soak the seeds in a solution of 3-percent hydrogen peroxide and water, for 30 minutes. Rinse the seeds with water before planting. You also want to mix hydrogen peroxide into the soil when you first sow the seeds and use a week solution to water the garden bed for the first week because it will kill the pathogens that are present on the seed coat. Due to its broad spectrum of antimicrobial activity, hydrogen peroxide is often used in laboratory and medical establishments to sterilize surgical tools and work surfaces. To disinfect pots, seed trays, and other containers, clean them with a 6 to 9 percent concentration of hydrogen peroxide. To avoid introducing harmful pathogens into your plants, dip your pruning tools into hydrogen peroxide before using and in between plants. To help strengthen your plant’s root system you can use hydrogen peroxide. The extra oxygen molecule allows plants to absorb the beneficial minerals and nutrients from the soil more effectively. Here is an effective fertilizer recipe to help boost your plant’s growth. In a medium container, combine the water and the hydrogen peroxide. Stir to mix thoroughly. Pour the solution into the soil around your plants. If you have an aquaponic or hydroponic system, adding hydrogen peroxide to the water will keep the system healthy. The aquatic life and roots of the plants will appreciate the extra supply of oxygen. Root rot is a common condition with hydroponic systems. Since hydrogen peroxide decomposes to oxygen and water without leaving behind toxic residues, using it in your systems is a lot safer than other chemical laden antiseptics that are used to combat the disease. Hydrogen peroxide can be used in the garden to keep pesky insects from destroying your garden. Sap-sucking insects, like the fungus gnat, stink bugs or even house flies, are affected the most, but the chemical solution can also kill the eggs and larvae of other harmful pests due to its substantial oxidizing effect. Hydrogen peroxide is an easy-to-use way to get rid of flies. It is inexpensive and safe for the environment. Combine the ingredients, stirring to mix thoroughly. Add the mixture to a plastic or glass spray bottle and spray the mixture throughout your garden. The hydrogen peroxide will also kill any bacteria that may develop on your fruits and vegetables. When plants are infected with a bacterial infection, they can quickly turn to mush. Usually starting as mold or mildew, hydrogen peroxide sanitizes and prevents spreading. The primary causes of bacterial infections are cuts and bruises on plant tissues, but the bacteria can be spread through insects as well. You can protect your plants from bacterial rot by spraying them with a solution of hydrogen peroxide and water. To stop the threat of bacterial infections, spray the solution on fresh cuts on tree branches or after pruning. When you are preparing your bulbs and tubers for storage, dip them in hydrogen peroxide to prevent bacterial rot from taking over as they are stored. A 10-percent concentration of hydrogen peroxide can be an extremely effective weed killer. Unlike the commercially available products, hydrogen peroxide doesn’t contain any toxic chemicals that can be harmful to your family and the environment. Kill the weeds that are growing between concrete or flagstone pavers by pouring hydrogen peroxide directly onto the weed. Because sunlight quickly breaks down the chemical, it’s best to apply it in the early mornings and late in the evenings to guarantee a prolonged action. Since a 10-percent concentration of hydrogen peroxide and above will indiscriminately destroy all kinds of vegetation that it comes in contact with, you need to use caution when using it around your plants. If it splashes on your hands or in your eyes, immediately flush the area with a lot of cold water. Hydrogen peroxide is a fantastic chemical that can be used as a cleaning agent, antibacterial agent and even in the garden. It is important to remember that when you are using hydrogen peroxide in the garden, you must dilute it to avoid killing your plants. Not only is hydrogen peroxide an environmentally friendly alternative to the harsh pesticides sold commercially, but it has the added benefits of being a strong anti-fungal and provides plants with a healthy boost of oxygen as well. So, if you haven’t already started using diluted hydrogen peroxide at home or in your garden, what are you waiting for? We hope you enjoyed this article about the surprising uses of hydrogen peroxide for your garden. Please feel free to share it with everyone you know.